Wind power uses the energy of the wind to generate energy. It can be harnessed to produce electricity, power mechanical machines, or used to move vehicles or objects. One established and still emerging use for wind power is in the production of electricity. Wind farms are set up with hundreds of wind turbines that is connected to an electrical network. These are usually situated in places with frequent and consistent powerful winds. These grid of turbines are then used for commercial or residential power. 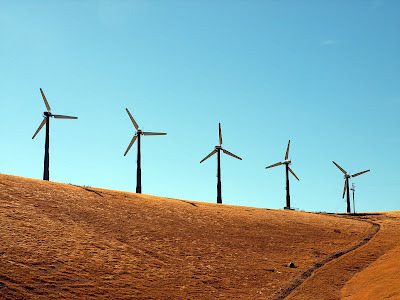 Wind farms are also used in conjunction with solar energy to provide power to isolated places that are not connected to an electrical network. The largest capacity wind turbine is the Enercon E-126 with a rated capacity of 7.58 megawatts (MW). It is 198 meters high (650 ft) and has a diameter of 126 meters (413 ft). In terms of productivity, the most productive wind farm is the one in Rønland wind farm in Denmark. The four turbines in the farm generates 63.2 MW each. There is enough energy available in winds to meet all of the world's demand. Atmospheric turbines that convert steadier and faster high-altitude winds into energy could generate even more power than ground- and ocean-based units. New research from Carnegie's Ken Caldeira examines the limits of the amount of power that could be harvested from winds, as well as the effects high-altitude wind power could have on the climate as a whole. Their work is published September 9 by Nature Climate Change.